The best coffee is generally made from recently roasted beans that have been ground just before being brewed. 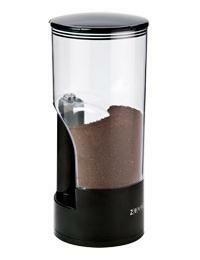 This maximizes the amount of oil in the coffee beans and gives the finished coffee the richest flavor. But we can’t always have our coffee this way. Sometimes a batch of beans sits around on the counter for a while before we get around to drinking it. Sometimes, we end up buying preground because there was a new flavor/brand available or we don’t have a bean grinder at our disposal. Whatever the reason, it is still possible to preserve the freshness of the beans by keeping them in an airtight container. The Home Coffee Dispenser is an airtight container that should keep beans – especially preground coffee that is prone to drying out – much fresher than other containers. Once the chamber is filled up, you can dispense coffee a tablespoon at a time into your coffee maker (or even your espresso machine) without opening up the whole thing and exposing all the beans to more air. It holds up to half a pound of coffee. The Dispenser is especially useful for an occasional coffee drinker, who likes to keep some coffee around but doesn’t make it much, since it not only keeps things fresh, but it makes it much easier to measure it out when you finally get around to using it.